Beer sits on the Southwest Coast Path - part of the Trans-European network of long distance paths, known as GR routes - Grand Routes!!! Geology has made a real difference to the lives of people in Beer and its visitors. Beer is a gateway to The World Heritage Coast. It stretches from Otterton Point in the West to Old Harry Rocks in the East. 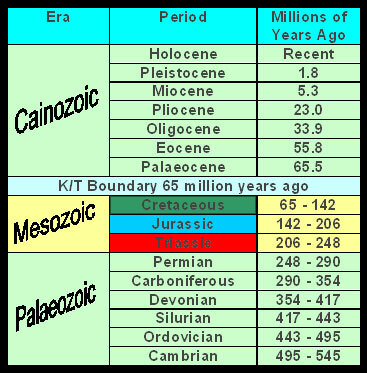 It covers the whole of the Mesozoic Period; The Triassic, the oldest of the three, the Jurassic in the middle and lastly the Cretaceous. 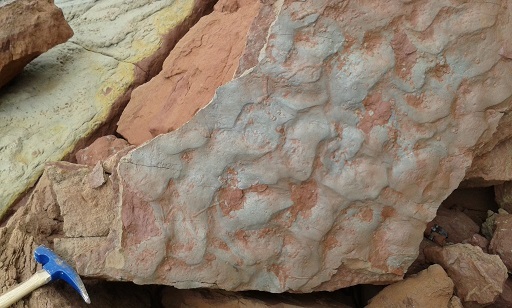 Cretaceous comes from the Latin, creta, meaning chalk. The Cretaceous played host to last of the dinosaurs; which were probably driven to extinction by a meteorite collision with Earth 65 million years ago. It is called the KT boundary and is marked worldwide (though not here) by a thin layer of iridium, a rare element. Cretaceous rocks stretch from Flamborough Head, in Yorkshire, south to the white cliffs of Dover and west to Dorset. They then fade away, due to erosion, and Beer is the last significant outcrop of Cretaceous rock going west. The white chalk at Beer stands out immediately against the red Triassic mudstones on either side, making it a memorable place. There is the fault line to the east of Beer. Whitecliff (or Head of Whitcliff) has dropped about 60 metres compared to the red cliffs of Seaton to the east, where the Cretaceous has been eroded away leaving the Triassic exposed. There is no Jurassic rock here. It is an unconformity. 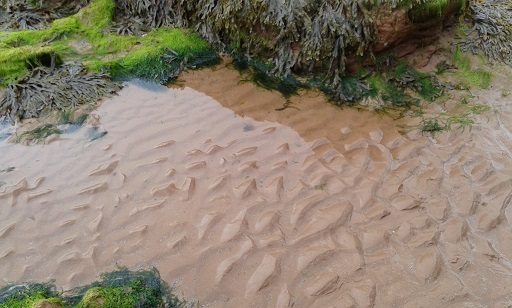 The first Jurassic layers appear about 2km to the east of Seaton. Beer Head, a great navigational aid, protects Beer from prevailing so’ westerly gales as well as northerlies. Beer sits in a syncline; a dip or fold, in the chalk and each of the layers has had an impact on the life here, the Greensands (with its chert beds), the Chalk with its Freestone and flints. The beach is made up of flints that have eroded from the chalk, some rounded off by the action of the sea, some more recently fallen with a knobbly appearance and some still with a trace of cortex or skin. There are also lumps of chalk. You can find fossils in the Cretaceous, although not as plentiful as the Jurassic. Beer is an unconformity in the Walk Through Time along the World Heritage Site, where the greensands and chalks of the Cretaceous period come out to the sea at Beer Head and sit next to the Triassic sandstones at Seaton Hole. So what opportunities has this presented to people throughout history? Neolithic man came to Beer 6000 years ago. He knew that black flint can be shaped and sharpened to make cutting tools and axes. He may have realised that flints are often associated with chalk, and noticed that Beer Head has the most westerly white cliffs. The cliffs themselves may have been a good source of flint, although he will have discovered that flints which have been rolled around on the beach are difficult to knap. We know that Stone-Age man made tools from Beer flint and took, or traded, it over a wide area indicating that the people in Beer were in contact with other groups. Neolithic man also used chert for scrapers, which have been found locally. New Stone Age (4000 -2000 BC) tools made in Beer have been found at Hembury, Haldon and as far away as Carn Brea in Cornwall. In 1645 Beer flint was used in flintlock guns for the New Model Army, and black flint is apparently still used today for scalpels for eye surgery. The next recorded inhabitants of Beer were the Romans who quarried stone, creating the first of the underground caves for which Beer is famous. They realised that the Beer freestone has such a fine grain that it can be carved as well as being used as a building material. They found the other ingredients for buildings locally – sand from greensand, chert, chalk for lime wash and mortar, as well as gypsum from Weston. We know that the Romans built a villa at Honey Ditches in Seaton, and possibly one in Beer, and they also used Beerstone to make small items like lamps. The Saxon church of St. George's in Exeter is partly built with Beer stone that was recycled, having been used originally in a Roman building. We know that the Romans settled in Beer for at least three hundred years because coins for each of the 3 centuries have been found at the caves. What we don't know is where they used all of the stone which they quarried. While they sought Beer stone below ground the Romans also realised that the south-west facing slopes of thin limestone soil were ideal for grapes, and so they brought vines to grow. We assume they were successful, because much later, around 1200, Beer provided wine for Sherborne Abbey. Beer Head stands out because the late Cretaceous chalks have not eroded as much as the Triassic sandstones to the east. It provides a natural shelter from the prevailing winds, which means that fishermen can launch and recover their boats at most states of the tide. We know that this is an ancient occupation as in 1145 Beer fisheries and salt pits were ceded to Sherborne Abbey. Beer still has a fishing fleet and was, of course, also famous for smuggling. Today, local stone in Beer is still making history. Small pieces of greensand from the village have recently returned after 18 months in space. Scientists have ascertained that the microbes in the greensand have survived their epic journey. So, when your great-grand children blast off on a journey to Mars or Venus, where they will have to grow their own food, you will know that Beer provided the evidence that organisms can survive and grow in space. by Norah Jaggers, Ambassador for the East Devon and Dorset World Heritage Site. Beer Village Heritage.